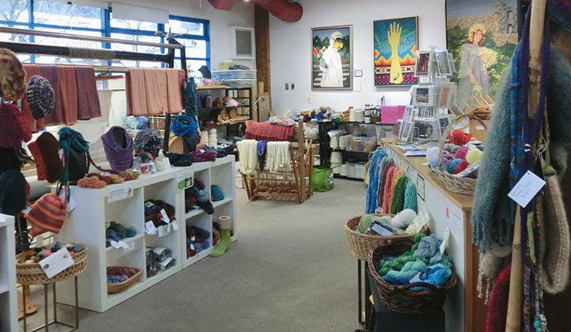 Fibre Art Studio, home to five fibre artists, is located on Granville Island, Vancouver. We opened our studio's current location to the public in November 1979 to create, display and sell our work, as well as to network with our customers and fellow artists/artisans. Everything offered at our studio is handmade by our members. Our collective work is comprised of tapestry weaving, hand-loom weaving, knitting, felting, spinning and dyeing. We create, both, visual and wearable art, as well as practical textiles for the home, with each item being one-of-a-kind or part of a limited edition. In addition to our finished work, we offer a wide range of hand-dyed luxury yarns and fibres, as well as handspun yarn. Knitters, weavers, felters, quilters and mixed media artists are among our regular customers. Our regular open hours are 11am to 4pm everyday. Yarn Crawl Hours: Friday: 11am – 8pm; Saturday: 11am – 8pm; Sunday: 11am - 5pm.